An overhaul of the in game fonts. 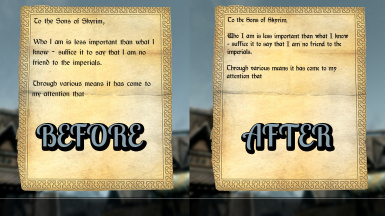 Thanks to Valistar for his work on the Main Font Replacement mod. This is what inspired the idea and I did borrow one of the fonts, only because Fertigo is the perfect font for this game. 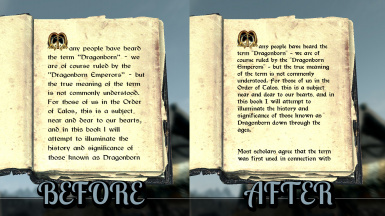 I've always felt the fonts in this game need attention, especially the books and notes. 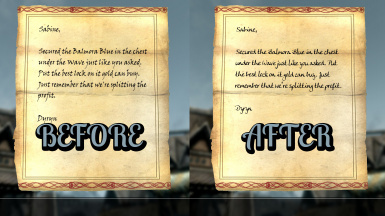 This changes the fonts of the menus, books, console, etc. to more appropriate and arguably more legible versions while maintaining the feel of the base game. During my testing, I have found no real issues and this should be compatible with everything that doesn't modify any fonts.